In the post reality, there is no longer separation between that which is real and that which is not. In the age of digital photo manipulation we can no longer trust the authenticity of the image. Political campaigns now instigate this form of “reality enhancement” as acceptable practice for communicating their truth-bending propaganda. While Donald Trump is the master of reality distortion in his hypermediated rants, morphing position and attitude at the instantaneous speed of the media, the Ted Cruz political hacks have hacked into our collective consciousness via the visual messaging powers of Photoshop. And they defend this alternate reality as perfectly legitimate, calling it ironically the “Real Rubio Record.” In the above photograph there is no attempt to conceal the Photoshopped staging of Marco Rubio and Barack Obama in a virtual handshake over immigration reform. In the post reality, where truth dissolves in the hazy collage of photo manipulation, there is an eerie quality here to the undisguised mismatch of head & body & hand & shake. To pay credit where credit is due, the Cruz propaganda in not unlike the counter-propaganda I flung against the post-911 Bush Administration shortly after forming my virtual government agency: the US Department of Art & Technology. 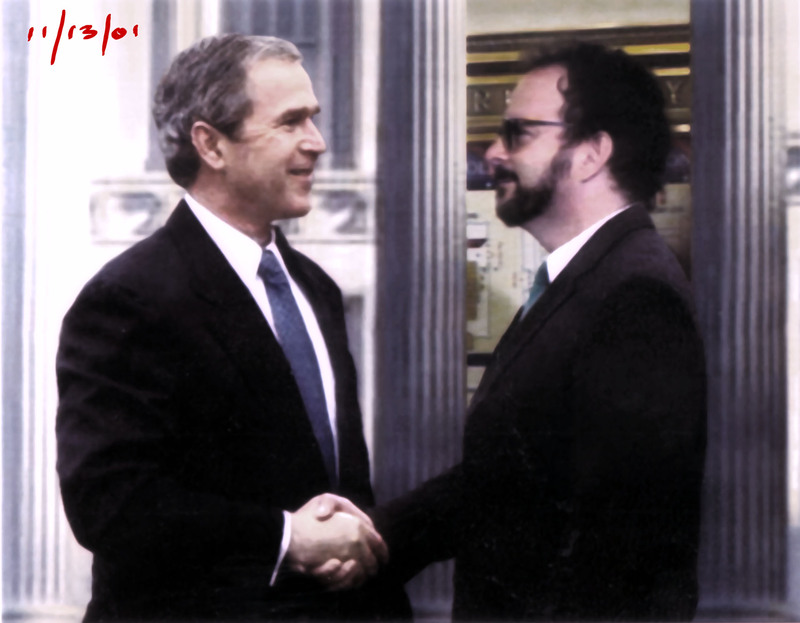 This image was created 15 years ago in 2011, a form of artistic mediation I used to insert the artistic message into the mainstream political narrative. Nowadays, “real” politicians are resorting to the same tactics, but without irony or critical investigation: just pure intentionally deceptive propaganda designed to undermine critical, independent thinking of real voters in real elections. I was concerned with giving the artist voice in times of crisis to illustrate the powers of propaganda rampant in the politically-motivated acts of pseudo-patriotism fueling the post 9/11 climate of fear. 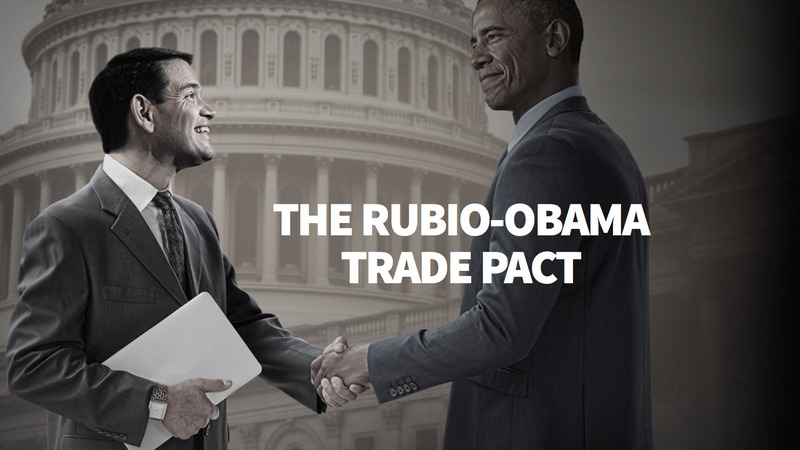 But with the 2016 Cruz version of the virtual handshake, Rubio and Obama are heartily signaling their jubilant agreement over immigration reform, as though the past three years of bitter acrimony over the issue had been wiped clean from our memory. In this fabricated image, we see the distortion of truth being used as a weapon of propaganda intended “disinform” and disarm the voter, just as Hitler or any number of dictators had done in earlier times to cloud and destroy reality. It’s a dangerous precedent to say the least. In the age of malleable pixels, a digital portrait of reality can be whatever we want it to be in order to fashion, transform, and reshape the truth according to the agenda. But whereas the artist masters techniques of representation to stimulate thinking, challenge the status quo, attack misconceptions… the political hacks who design campaign propaganda for ruthless politicians will intentionally misrepresent truth in their insatiable thirst for power. In the hands of the politician, techniques of media and virtualization become a true weapon of mass destruction, annihilating our ability to reason, think, and make informed decisions concerning the most urgent issues of our time. With Trump leading the charge, and Cruz shortly behind, we have, in essence, rejected reality in pursuit of a fabricated notion of what Stephen Colbert calls “truthiness,” or what Jean Baudrillard refers to as “hyperreality,” which I now label the “post reality:” a new way of way describing the abandonment of reality. We have entered into a permanent state of make believe: shifting beyond the suspension of disbelief into a digitized notion of reality that no longer even asks us to pretend. In the wonderful state of Post Reality anyone can be a politician, even a Donald Trump. Just brand yourself as one, as a Duchampian individual might call itself an artist. It does help to have lots of money, though. The role of the politician as a found object declared by the artist as art: is it possible that Trump is the greatest artist since Duchamp?